Pictou County established in 1835, has a very rich history and experienced many changes over the years. Unlike modern day where there seems to be a camera around every where you look and digital photos are like a ‘dime a dozen’ ; historical photos are more precious and can help us to better understand what things were like around here back in time. Recently we found a some boxes of old photos in an old house that we have fixed up into a summer home and bought a few at some yard sales. Therefore decided to create a place on the web where we can preserve and share old photographs of Pictou County that we come across and that what more people can appreciate Pictou County’s rich history. We dedicated a section of our website for old Pictou County photos as well as started a large Pinterest board where others can contribute. 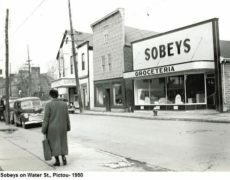 So if you are looking for old Pictou County historical photos then you will want to check out our growing collection of old Pictou County photos both here on PictouCounty.net and on Pinterest. The Pictou County Historical Photos pin board contains scans of historic photos we have scanned, as well as many others that we have come across on the Internet [if you or someone you know have photos that you would like to share, then we would be more then happy to hear from you]. Follow Historic Pictou County Photos on Pinterest.